Myra Seaman and I are very excited to announce that postmedieval, vol. 1.3 [Fall/Winter 2010] has hit the material and virtual presses this morning, just in time for the BABEL Working Group's 1st biennial meeting at the University of Texas in Austin, where Palgrave will be passing out free print copies. 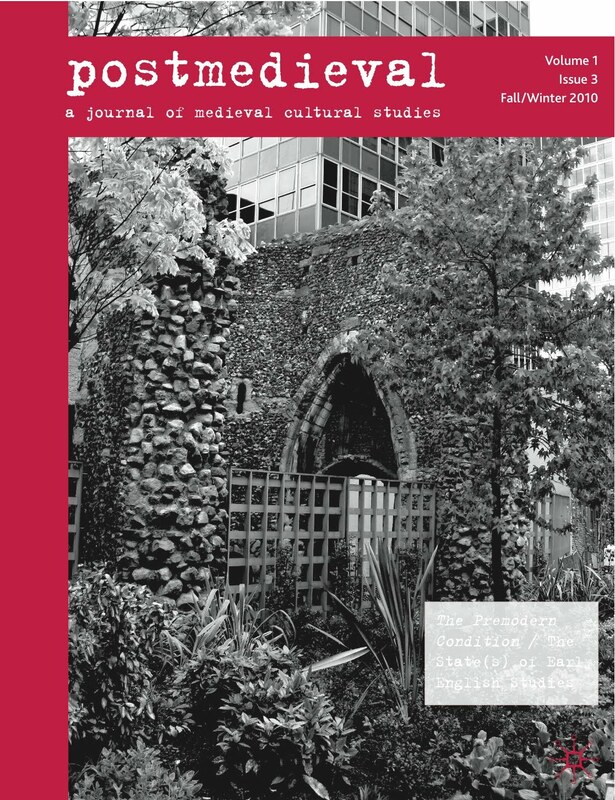 We are also very excited to announce that one cluster of essays in this issue, "The State(s) of Early English Studies," is also published in tandem with the newly released issue of The Heroic Age: A Journal of Early Medieval Northwestern Europe. The issue is devoted to two clusters of essays--the first is a lively round-table discussion between Louise D'Arcens, Clare Monagle, Stephanie Trigg, and Bruce Holsinger over Holsinger's book The Premodern Condition: Medievalism and the Making of Theory (Chicago, 2005), which had its genesis in a panel organized by Clare Monagle for the Australian and New Zealand Association for Medieval and Early Modern Studies (held in Hobart, Tasmania, in December 2008). The second essay cluster began as a panel on Old English studies and theory at the Kalamazoo Congress on Medieval Studies in 2008, jointly sponsored by BABEL and the online journal The Heroic Age (and featuring remarks by Kathleen Davis, Kathryn Powell, Jacqueline Stodnick and Renée Trilling, Mary Swan, and Stacy Klein). Originally envisioned as a round-table discussion that would consider and explore how already-established critical theories (such as those associated with psychoanalysis, deconstruction, gender and sexuality studies, new historicism, postcolonial studies and the like) either had, or had not, been taken up, appropriated, applied and re-formulated within Old English studies, the lively discussion itself at Kalamazoo made it clear to all of us that, in some respects, this was either a moot or an exhausted or unproductive question – after all, Gillian Overing declared almost 20 years ago at the annual convention of the Modern Language Association, ‘we are changed by this new work,’ which ‘has, indeed, arrived.’ And essay collections such as Britton Harwood and Gillian Overing's Class and Gender in Early English Literature (1994), Katherine O’Brien O’Keeffe's Reading Old English Texts (1997), Allen Frantzen and John Niles's Anglo-Saxonism and the Construction of Social Identity (1997), all now over 10 years old, as well as anthologies such as Eileen Joy and Mary Ramsey's The Postmodern Beowulf (2007), have all devoted more than ample room to the demonstration of the value of productive convergences between postmodern theory, Old English literature, and Anglo-Saxon culture and history, and they have also cleared new theoretical grounds in early English studies. This is not even to begin to mention the singular contributions of the scholars included in this essay cluster, which are various and many. We decided that a better tack for the cluster of essays to be developed after the session at the Kalamazoo Congress would be, not to mull the place and uses of theory only within early English studies, but rather to consider what the position of contemporary Old English and Anglo-Saxon studies might productively be in relation to the histories and ongoing development of theory (critical, cultural, historical, social, political, aesthetic, ethical and so on), and to all of the ‘turns’ involved therein and to literary-historical studies more generally. What, further, might be important new directions in contemporary intellectual discourses (academic, public and otherwise) for which the study of early English culture and history might be critically important and indispensable? What subjects remain neglected or under-developed in early English studies and what, further, are some of the more promising ‘new’ directions in early English studies today? In short, how might we sketch out some of the futures (with an emphasis on the plural) of an early English studies that is not (and never really was) a realm apart from either later periods within literary-historical studies (including the later Middle Ages) or from contemporary life and thought? 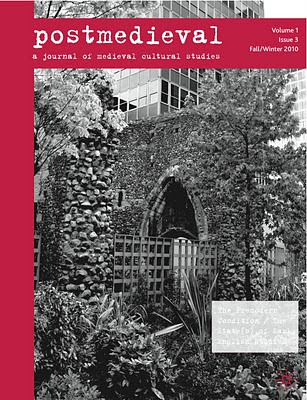 The cluster, featuring contributions by Kathleen Davis, Mary Dockray-Miller, Clare Lees and Gillian Overing, Carol Braun Pasternack, Jacqueline Stodnick and Renée Trilling, Elaine Treharne, and Lisa Weston, covers subjects as richly various as the marriage debate in Anglo-Saxon England and contemporary America and its textual production, past and present (Pasternack), the place of pleasure in Old English studies within the context of the California budget crisis (Weston), the contribution early English studies might make to studies of embodiment and the so-called ‘new materialisms’ (Stodnick and Trilling), the debt of modern poetry to Old English verse (Treharne), legal precedent and medieval/modern periodization (Davis), new media aliteracy and language study (Dockray-Miller), and our ethical (and gendered) relations to questions of temporality and disciplinarity (Lees and Overing). In order to craft a bridge for this essay cluster between a journal that aims to bring the medieval and modern into productive critical relations for a broad audience within the humanities and beyond (postmedieval) and a journal that primarily specializes in studies of early medieval northwestern Europe (The Heroic Age), we are publishing this cluster across the two journals, with the essays by Davis, Pasternack, Stodnick and Trilling, and Weston appearing here in this issue, and the essays by Dockray-Miller, Lees and Overing, and Treharne appearing in Issue 14 of The Heroic Age. The Heroic Age is an online, open-access journal and the essays there are fully available online; the essays here by Davis, Pasternack, Stodnick and Trilling, and Weston will be available free online for a brief period in November [until Nov. 18th], in order that the entire cluster may be read together online at that time. In the spirit of the collaborative labors (which are also feminist) evidenced by so much of the work of the scholars published in this cluster, it is hoped that more such collaborative ventures between journals and other publishing media can be crafted in the future as well, in order to initiate and work to sustain a more collective humanities, across time ‘periods,’ research specialties, disciplinary affiliations, modes (and even genders and trans-genders) of transmission, and languages. Such might also be a move toward new collectives or networks, also called friendships, tilted at a futural humanities in which the study of the premodern past would play an integral and provocative role. The first church was built adjoining the London Wall, with the wall forming its northern side. The churchyard lay to the north of the wall. The earliest mention of this church dates to c. 1108-25, though it is said that it was established before 1068. The church was closed by Act of Parliament at the end of the sixteenth century and demolished. The London Wall was left standing. The site of the church became a carpenter's yard. In 1837 it was laid out as a public garden, which remains today, with a preserved section of the London Wall on its north edge. After the realignment of the road London Wall, that section formerly running past the site of this church was renamed St Alphage Gardens. The churchyard to the north of the London Wall was still open in 1677, but was subsequently built over. The last building on the site, using the London wall as its southern boundary, was destroyed by bombing in the Second World War. This exposed the Roman city wall that the medieval wall had been built on. When a new Salters' Hall was built on the site (opened in 1976), the area north of the London Wall was made into a garden for the Hall. The photograph seems fitting then, as well, for the cover of an issue also devoted to Holsinger's book, an elegant excavation of the medieval influences undergirding the work of some of the most brilliant thinkers of the postwar French intelligentsia, such as Georges Bataille and Roland Barthes. Let me add, finally, that this issue also features a book review essay by Paul Strohm, "Historicity Without Historicism? ", which covers the following volumes: Andrew Cole and D. Vance Smith, eds., The Legitimacy of the Middle Ages: On the Unwritten History of Theory (Duke Univ. Press, 2010); Elizabeth Scala and Sylvia Frederico, eds., The Post-Historical Middle Ages (Palgrave, 2009); and “Medieval Studies in the Twenty-First Century,” Theories and Methodologies essay cluster, PMLA 124.2 (March 2009): 576-646 [featuring essays by Josiah Blackmore, Jessica Brantley, Christine Chism, Bruce Holsinger, Steven Justice, Sharon Kinoshita, Karma Lochrie, Karla Mallette, and Peggy McCracken].
. . . although the church itself is post-conquest, it is named for St AElfheah of Canterbury, who was killed by Danes in Greenwich, south London in 1012. His wiki is here -- A very interesting character indeed (and I've got an essay on him and his church in Greenwich coming out next year, so he's been something of an obsession for me. Haven't read the issue yet, but the cover is beautiful.